In my social media timeline, for the past few days, I’m noticing many people embracing oats for breakfast as though it’s a super food and going to the extent of eating 5 times a week. Brands are also promoting it aggressively by partnering with popular food bloggers in accordance with the New Year resolution healthy eating/fitness/well-being themes. As humans, we seek instant solutions. And this behaviour is well in tune with what the brands expect from us. Take a few spoons of oats, add water/milk, MW it, add some fruits and nuts and you are done with breakfast. And many people don’t mind following the same routine on all 5 days of the work week, as it is convenient, less time to prepare and can be eaten hassle-free with a spoon in one hand and a smart phone in the other. Traditional breakfasts are being put under the back-burner for special occasions or for weekends. If dosas/idlis have to be made for breakfast, the batter has to be available and the preparation of chutney/sambhar as an accompaniment is an additional overhead. Why take the extra effort - “let me whip up some pancakes and drizzle some ready-to-use sugar-laden maple syrup” is the attitude these days. Sorry for the digression. Why am I against oats? 1) Oats is not a native grain of India. It is imported from Australia, New Zealand and a few other countries in Europe. 3) Quick cooking Oats taken as a porridge doesn’t fill you up. You’ll start to feel hungry within an hour or so. I’m speaking from my experience. I had tried taking quick cooking oats regularly for breakfast 6 years back and by the time I reach my office, I would feel hungry and I would end up grabbing some biscuits and tea. 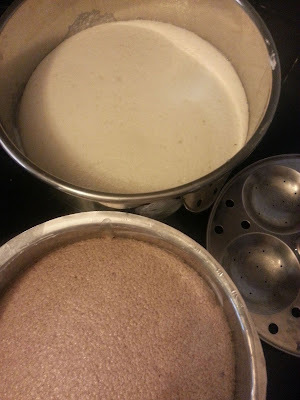 2) During Sundays, I make millet idli/dosa batter. Soaking the grains takes hardly 5 minutes. Grinding the batter takes 10-15 minutes. That’s it - with an investment of 20 minutes from my Sunday, my breakfast is sorted for 3 days. I make batters with all types of millets, ragi, bajra, jowar and regular rice, alternating each week. 3) On Mondays, I make idlis with fresh fermented batter. I keep stock of home-made idli chutney podis (regular chutney podi, flaxseed podi and horsegram podi) which I would serve as accompaniment. Sometimes, I would make sambhar which I would use for both breakfast and lunch. 4) On Tuesdays, I make crisp dosas and on Wednesdays, the same batter would be used for veg oothappams. 6) Varieties of upma can be made using regular sooji, wheat rava (samba rava), broken wheat (lapsi) and millets. Add a handful of veggies, ginger and lemon juice. More nutrition, freshly prepared and you don’t need to make a side-dish. A little pickle and curd would do. It is appalling that well-educated people fall into the trap of endless promotions by brands endorsed by film actors and actresses. My request to you is to not blindly accept these tall-claims, looking for instant solutions and results. If you are looking for weight loss, it requires a LOT of effort. Eating a bowl of quick cooking oats or Kelloggs-K will not magically melt away the excess fat from your body. P.S. If you still want to eat oats, then please ask your friends abroad to send you a pack of rolled oats, which is high in fibre as compared to quick cooking ones. Maybe, it is also available in gourmet stores that sells imported foods. Thanks for highlighting the nature and quality of oats that r available in India. I didn't know that rolled oats r good for health. If I am not wrong, I thinks millets should be soaked for a few hours and then made into idli and dosas. Pl share some receipes of fast idli and dosa preparation. Thanks a lot. Are rolled oats not availablein India? Are they hard to cook? Would you please compare oats with foxtail millets in terms of nutrition, and the 5 4 other millet-types that Dr. Khader Vali, the Millet Man , advocates in daily use.